The outline adds: “The quality of the answer is located in the process of searching for solutions rather than in the answer itself.” The aim is to enable students to reflect on “life’s big questions” and to develop “critical, creative, collaborative, caring thinkers.” (Source: ‘Students to be offered new philosophy course’, Joe Humphreys Irish Times 12/01/2016). The President’s Ethics Initiative began in 2013. It was an invitation to Irish people to explore ethical values and the role they have in shaping society, with a view to making society better for all. It involved higher education institutes and civil society organisations. Over 60 events were held, including lectures, seminars, conferences, activities and ‘citizens conversations’. On1 February 2016 the President launched the report. It is called The Importance of Ethics, The President of Ireland Ethics Initiative. It is available on the President’s website. The National Council for Curriculum and Assessment is planning to introduce new classes in ethics and religion in Primary schools. The subject will be called “religion, beliefs and ethics”. It will be separate from existing faith-based classes in denominational schools. The overall aim is to enable students to learn about the lives, values and traditions of the wider community. It will not be focussed on any one religion and will include secular beliefs. Its aim is to help children develop empathy with people of different religions and beliefs. The ethics component will focus on enabling children to make choices and decisions with consideration for their effects on others. It will be based on the values of human dignity and freedom, and on human rights and responsibilities. (Source: ‘Primary students to learn ethics’, Carl O’Brien, Education Editor, The Irish Times 4/11/2015). Source: ‘Philosophy: the subject that improves children’s literacy, numeracy and conduct’, Joe Humphries, The Irish Times, 15/08/2015. ‘If we are to recover, and flourish, we must understand the structural, philosophical reasons for the failures we have witnessed and we must reconnect the economic, the social and the political to the moral’ (Michael D Higgins in ‘Time for citizens to forge a better future for our country’, The Irish Times 2/04/2014). 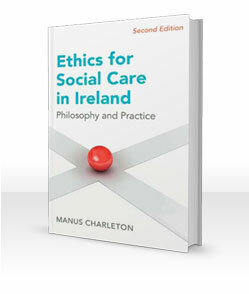 "The second edition of this popular book introduces the subject of ethics for social care and social work by exploring ethical values and principles for the ways in which they inform and guide best practice for care in Irish society today. Provides guidelines on how to write essays on the topic of ethics in social care."